The mycelia and the hyphae are both important parts of fungi, more commonly known as the mushroom. The two terms refer to the building blocks of fungi. Hyphae (plural form; singular form is hypha) is the name of the long, individual pieces that comprise a mycelium. Hyphae are often described as strings and threadlike filaments. The hypha is the basic body plan of a fungus. It is comprised of one or more cells surrounded by a tubular cell wall. Hyphae can be classified into categories by their cell division, by their cell wall and overall form, and by their refractive appearance. Hyphae by cell division can be further classified as septate (with septa), aseptate (without septa), and pseudohyphae. The first two classifications are considered to be “true” hyphae. In addition, hyphae classified by their cell walls are separated into three categories: generative, skeletal (which is divided into two – the classical form and fusiform skeletal), and binding. Unformed hyphae are called yeast – a substance that is very useful and applicable in many industries and fields. On the other hand, mycelium (plural form – mycelia) is the vegetative part of the fungus. In relation to the hyphae, it is the network collection or bundle of hyphae in one single place. Unlike the hyphae, the mycelia can be visible to the naked eye in the form of mold on various surfaces including damp walls and spoiled food. The mycelium is also part of the fungi’s anatomy that performs asexual reproduction. This is possible due to fragmentation where the process maintains the clonal population that is adapted to a particular niche. By virtue of asexual reproduction, this process permits more spreading compared to the other form of reproduction – sexual reproduction. The mycelia are also involved and used for other human purposes. The mycelium, in the process called mycofiltration, acts as an organic filter for soil and water. Applications of this process are usually to prevent soil erosion caused by water runoff and into abandoned logging roads. Mycomediation is another process used to filter contaminants out of polluted environments or to prevent further damage of contaminants to water or soil. Mycomediation is extremely useful in cases of oil spills and other accidental spills. In the medial field, mycelium is used in patients with heart problems. Both the mycelium and the hyphae are responsible for an important body process of fungi – absorption of nutrients and food from the environment. The hyphae in every mycelium produce the enzyme for this purpose. The enzymes break the food or nutrients and other digestible forms. The breaking down of food can also be used for other purposes like decomposition of organic materials, which helps renew the soil. 1.The hyphae and the mycelium are parts of fungi anatomy. The hypha is the building block of a fungus. On the other hand, mycelium refers to the collection of hyphae in a fungus’ body. 2.Hyphae are often described as strands, threads, or filaments because of their appearance. The mycelium, as a collection of hyphae, looks like a patch of threads or strands. 4.Since the hypha is also a building block of the mycelium, its characteristics and function are basically the same. The hyphae function on a micro level or smaller scope compared to the mycelium’s macro or larger cope. 5.The hyphae and mycelium are very important in the nutrition of fungi. The hyphae release the enzyme for the fungus (or mycelium) to decompose the surrounding food into a digestible state. This deconstruction is also useful in the decomposition of organic material and renewal of soil in the vicinity of the fungus/hyphae. 6.Mycelium has a multitude of uses as part of the fungus and in human applications. 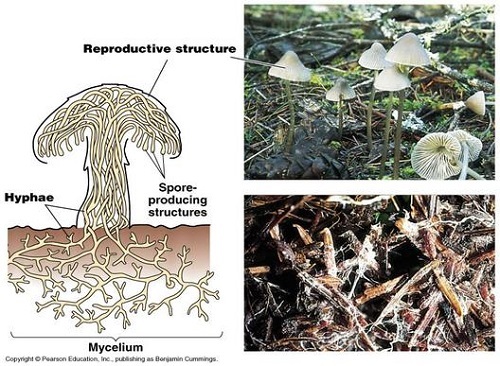 Mycelium as part of the fungi helps in performing asexual reproduction through the method of fractioning. In addition, mycelium is popularly used in abandoned logging roads and in mycofiltration and mycomediation. Celine. "Difference Between Mycelia and Hyphae." DifferenceBetween.net. July 31, 2017 < http://www.differencebetween.net/science/nature/difference-between-mycelia-and-hyphae/ >. If you scroll to the very bottom, past all of the comments, there is a section that says MLA or some sort of variation of that. It has the information for the page you are viewing; including the author.